Chess was occasionally criticized in the 19th century as a waste of time. Intelligent Qhess encourages this notion. Intelligent Qhess is here to elevate the meaning of Chess. It is a new beginning in the world of intellectual thought. 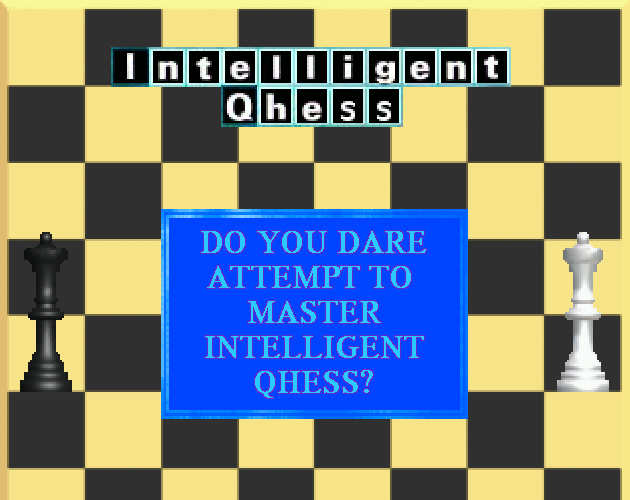 In Intelligent Qhess, you will have to reconsider all of your preconceived notions about Chess, Imagination, and Life. To begin playing, download, unzip, and run Intelligent Qhess.exe. The menu and gameplay of IQ are controlled completely by the mouse. On the main menu, you will have two sets of options: player modes, and gameplay settings. Choose a suitable player mode: IQ can be played by 1, 2, or 0 people! If you are playing by yourself, I recommend having a match against CPU L2 to start with. But nothing will ever be more strategic then the wit of another human opponent... When you are ready, click on the "BEGIN MATCH" button! The game will begin immediately. On your turn, simply click on a piece to select it. Then click anywhere on the board to attempt a move. Further, more detailed instructions may be found in the README. You can play this game on Linux using WINE! More detailed credits are available in the README. I've added this to the Introductions event because I think quite earnestly that IQ is one of the best games I have ever made, and as such should be a stellar introduction to what I find amusing about game development. I do, after all, intend for most of my games to be objects of humour. This is really fun and I like the pseudo 3d effect. How the heck did you do that? Its like witchcraft. 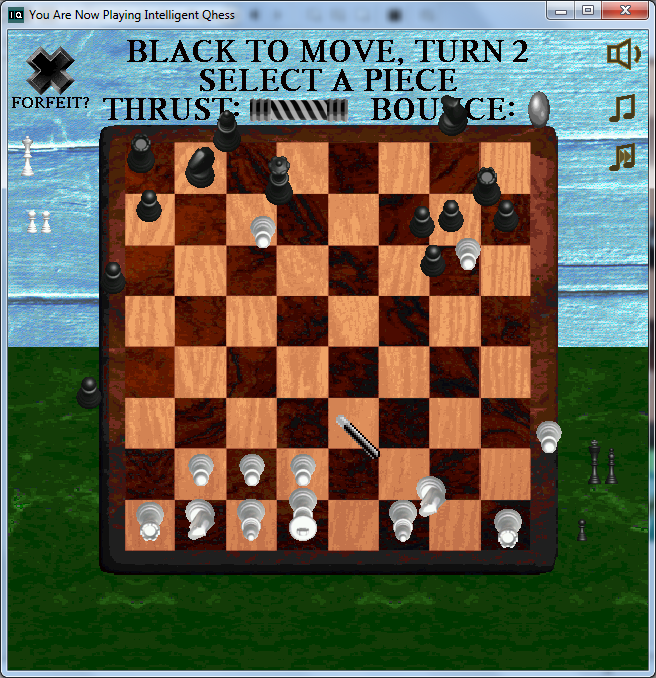 I figured since it is a chess game, I would play it while listening to the most sophisticated music, FREE FORM JAZZ. Needless to say, I feel enlightened and mentally stimulated, and will be forcing all of my friends to play this with me. I'm glad you enjoyed it, I hope your friends have fun too!! The pseudo 3d is simply how the chess pieces were drawn- they're from Clickteam's klipart, specifically the ones included in MultiMedia Fusion 2 and up. I originally was going to have the bottom row of pieces flipped vertically to try to enhance the effect, but unfortunately it is so strong it makes me feel like I'm going to fall into the computer (see attached). I'm glad to hear you didn't have any problems with WINE on Mac! I was hesitant to mention that in the description, since I don't have any way to test it myself, but I'll probably update it to make it clear it should work fine!! Yeah those inverted graphics make me feel like I might puke up code and pixels. Maybe not using that was for the best. This was very fun to play. Black totally forfeited. It was super satisfying to knock them off, but what really did it was the screen telling me that I made an intelligent move. yeah I did! The physics were great, loved the bounce!! Thank you, I'm glad you had so much fun! I had a lot of fun writing the praise messages :) And I'm very pleased with how well the silly physics turned out! I do like the extension of the VegGard2 concept of constantly complimenting the player. The gameplay is surprising in that nothing alludes to its form, but it's so intuitive once you figure it out. I also like the idea that you could totally play this in real life. Wow, I didn't even make a connection to VegeG2 from here, but yeah I suppose I did continue with that! (Albeit, in a much more restrained form, so I was able to have all the text handled correctly in WINE). I should play Intelligent Qhess irl sometime!! I have been playing IQ every day. It has consumed me. help, I am losing free will as IQ takes control. This game has me under control. HOW ADDICTIVE CAN IT BE? Outstanding formalist accomplishment in games.